Marc Tessier-Lavigne recommended this book in his recent talk given at Stanford University. 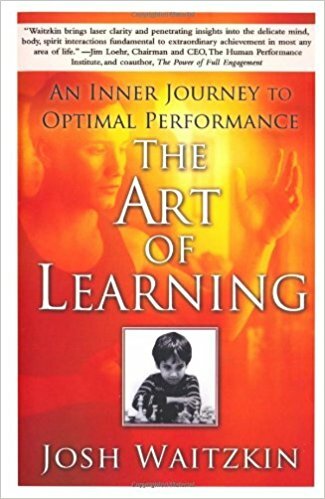 The Art of Learning details the author Josh Waitzkin’s journey of reaching the top of his first field, chess, followed by his transition into Chinese martial art, Tai Ji Quan, and winning multiple championships. Had the book just stopped there, when you reach the last page of the book, you would just yawn, wonder what the point was of hearing how good the author is and the book would have been much less good a read. I would definitely not bother to include it here. My time is priceless! The most appealing part to me is how Waitzkin refined his approaches, thinking, and his capabilities, both psychological and physical, throughout his quest for peak performance. I am impressed by his search for these deeply buried insights, a lot of which he probably achieved only through very painful introspection and tireless self-reflection. My (not necessarily accurate) conclusion is that these efforts separated Waitzkin from the rest in the contests of chess or Tai Ji Quan. This book came at great timing, as I am transitioning from domains X, Y, and Z to quantum computing (QC). I was scared before I officially started my first day in QC. For a short while before my first day, my mind rode roller-coasters: “Damn it, DongPing, you are being totally foolish, why on earth do you think you could make any impact in an utterly new field?” “Well, I do not care. I am fascinated by it. I am quick at learning stuff. The past a few transitions can comfortably prove that. In any case, I will have fun. Besides, there are a bunch of extraordinarily talented people in QC. I can learn, cannot I? ” Bizarrely, the moment I actually started working on QC, not a trace of fear has ever entered my mind ever since. I am completely absorbed in an insane amount of learning, thinking and fascination. Now a few weeks have passed. I alone have not made any original contribution to this vast new field, but I succeeded in probing and helping others to invent something that naturally we could not possibly share here. Its significance can only be evaluated retrospectively in time. Hopefully, reading this book helps me to go further and beyond what I could have done without inputs from it. A few years ago, the BBC aired the first series of drama Silk. I enjoyed it. The leading character, a barrister, Martha Costello, was inspiring. I thought of her a few times recently. Her ambition, her focus and dedication in reaching it, her strength in combating the relentless pressure of criminal bar. I have not watched the film Searching for Bobby Fischer about Josh Waitzkin. Perhaps one day in the future. One has to investigate the principle in one thing or one event exhaustively… Things and the self are governed by the same principle. If you understand one, you understand the other, for the truth within and the truth without are identical. Glory had little to do with happiness or long-term success. In top-rank competition, I couldn’t count on the world being silent, so my only option was to become at peace with the noise. The importance of regaining presence and clarity of mind after making a serious error…The first mistake rarely proves disastrous, but the downward spiral of the second, third, and fourth error creates a devastating chain reaction. When I was twenty-one years old and came back to America, I was more in love with the study of chess than ever. The game had become endlessly fascinating to me, and its implications stretched far beyond winning and losing – I was no longer primarily refining the skill of playing chess, but was discovering myself through chess. I saw the art as a movement closer and closer to an unattainable truth, as if I were traveling through a tunnel that continuously deepened and widened as I progressed. The more I knew about the game, the more I realised how much there was to know. I emerged from each good work session in slightly deeper awe of the mystery of chess, and with a building sense of humility. Increasingly, I felt more tender about my work than fierce. Art was truly becoming for art’s sake. There are clear distinctions between what it takes to be decent, what it takes to be good, what it takes to be great, and what it takes to be among the best….If I want to be the best, I have to take risks others would avoid, always optimizing the learning potential of the moment and turning adversity to my advantage…There are times when the body needs to heal, but those are ripe opportunities to deepen the mental, technical, intenternal side of my game. For much of this book I have described my vision of the road to mastery – you start with the fundamentals, get a solid foundation fueled by understanding the principles of your discipline, then you expand and refine your repertoire, guided by your individual predispositions, while keeping in touch, however abstractly, with what you feel to be the essential core of the art. What results is a network of deeply internalized, interconnected knowledge that expands from a central, personal focus point. The question of intuition relates to how that network is navigated and used as fuel for creative insights. In every discipline, the ability to be clear-headed, present, cool under fire is much of what separates the best from the mediocre….While more subtle, this issue is perhaps even more critical in solitary pursuits such as writing, painting, scholarly thinking, or learning. In the absence of continual external reinforcement, we must be out own monitor, and quality of presence is often the best gauge. We cannot expect to touch excellence if “going through the motions” is the norm of our lives. On the other hand, if deep, fluid presence becomes second nature, then life, art and learning take on a richness that will continually surprise and delight. Those who excel are those who maximize each moment’s creative potential – for these masters of living, presence to the day-to-day learning is akin to that purity of focus others dream of achieving in rare climactic moments when everything is on the line. Breaking down the artificial barriers between our diverse life experiences so all moments become enriched by a sense of interconnectedness. I believe an appreciation for simplicity, the everyday – the ability to dive deeply into the banal and discover life’s hidden richness – is where success, let alone happiness, emerges. Why step into a martial arts ring if you don’t want to fight? My personal relationship to this question involves continuous internal cultivation. It is easy to speak of nonviolence when I am in a flower garden. The real internal challenge is to maintain that fundamental perspective when confronted by hostility, aggression, and pain. The next step in my growth process would be to stay true to myself under increasingly difficult conditions. When I think about creativity, it is always in relation to a foundation. We have our knowledge. It becomes deeply internalised until we can access it without thinking about it. Then we have a leap that uses what we know to go one or two steps further. We make a discovery. Most people stop here and hope that they will become inspired and reach that state of “divine insight” again. In my mind, this is a missed opportunity…There is a connection between that discovery and what you know – or else you wouldn’t have discovered it – and you can find that connection if you try. The next step is to figure out the technical components of your creation. Figure out what makes the “magic” tick.